In this week’s study from Tehillim / Psalms 67:1-7, the psalm opens saying, א לַמְנַצֵּח בִּנְגִינֹת מִזְמוֹר שִׁיר: For the director of music. With stringed instruments. A psalm. A song. (NASB) David continues saying, ב אֱלֹהִים יְחָנֵּנוּ וִיבָרְכֵנוּ יָאֵר פָּנָיו אִתָּנוּ סֶלָה: 67:1 God be gracious to us and bless us, And cause His face to shine upon us Selah. (NASB) He appears to be quoting from the Aaronic blessing (Bamidbar / Numbers 6:22-27). David desires for the glory of the Lord to be known throughout the earth, ג לָדַעַת בָּאָרֶץ דַּרְכֶּךָ בְּכָל-גּוֹיִם יְשׁוּעָתֶךָ: ד יוֹדוּךָ עַמִּים | אֱלֹהִים יוֹדוּךָ עַמִּים כֻּלָּם: 67:2 That Your way may be known on the earth, Your salvation among all nations. 67:3 Let the peoples praise You, O God; Let all the peoples praise You. (NASB) The Aramaic Targum states, 67:3 To make known your way in the land, your redemption among all the Gentiles. 67:4 The Gentiles will give thanks in your presence, O God, all the Gentiles will give thanks. (EMC) What is the significance of the Gentiles giving praise and thanks in the presence of God? Generally, the nations posed a threat to David and to the nation of Israel. David says “that Your way may be made known,” and the rabbis translate “to make known Your way in the land.” The blessing of His deliverance, will be proclaimed among the nations because of God’s mighty hand to deliver Israel. David continues saying, ה יִשְֹמְחוּ וִירַנְּנוּ לְאֻמִּים כִּי-תִשְׁפֹּט עַמִּים מִישׁוֹר וּלְאֻמִּים | בָּאָרֶץ תַּנְחֵם סֶלָה: 67:4 Let the nations be glad and sing for joy; For You will judge the peoples with uprightness And guide the nations on the earth. Selah. (NASB) When thinking upon the idea of the nations who oppose the nation of Israel and who oppose God, coupled with the Lord’s deliverance and David’s calling out to the Lord to make known among the nations the salvation of God, it is surprising that David says the nations will be glad and sing for joy. The reason being, the nations who are coming against Israel will be destroyed by the hand of the Lord. Is David referring to evil or righteous men in the nations? Are there righteous men who live amongst the nations that God would consider righteous? David concludes His Psalm saying, ו יוֹדוּךָ עַמִּים | אֱלֹהִים יוֹדוּךָ עַמִּים כֻּלָּם: ז אֶרֶץ נָתְנָה יְבוּלָהּ יְבָרְכֵנוּ אֱלֹהִים אֱלֹהֵינוּ: ח יְבָרְכֵנוּ אֱלֹהִים וְיִירְאוּ אֹתוֹ כָּל-אַפְסֵי-אָרֶץ: 67:5 Let the peoples praise You, O God; Let all the peoples praise You. 67:6 The earth has yielded its produce; God, our God, blesses us. 67:7 God blesses us, That all the ends of the earth may fear Him. (NASB) It could be those who are righteous who live among the nations that David is referring to. With regard to the righteous who live among the nations, is there salvation outside of being joined with Israel? What does it mean to be joined with Israel? Is it possible to take hold of the Salvation of God and not be a part of the nation of Israel? Hopefully these questions and more will be answered within this study. In this week’s study from Tehillim / Psalms 67:1-7, the psalm begins saying, א לַמְנַצֵּח בִּנְגִינֹת מִזְמוֹר שִׁיר: For the director of music. With stringed instruments. A psalm. A song. (NASB) David wrote music giving praise to the Lord in thanksgiving for His powerful deliverance and blessings upon his life. 2 Samuel 22 is one such example where David expresses his joy in the Lord’s deliverance from the hands of his enemies, and out of the hand of Saul. This week’s Psalm opens saying, ב אֱלֹהִים יְחָנֵּנוּ וִיבָרְכֵנוּ יָאֵר פָּנָיו אִתָּנוּ סֶלָה: 67:1 God be gracious to us and bless us, And cause His face to shine upon us Selah. (NASB) What do these opening words remind us of from the Torah? David appears to be thinking upon God’s deliverance of Israel from the Egyptians in the Torah by quoting a line from the Aaronic blessing (Bamidbar / Numbers 6:22-27). Most people are familiar with the beginning of the Aaronic blessing which states, “May the LORD bless you and keep you” (Bamidbar / Numbers 6:24-25). David appears to be quoting from Bamidbar / Numbers 6:24-25. Notice David writes, יְבָרֶכְךָ יְהוָֹה וְיִשְׁמְרֶךָ using the words the Lord will “bless” and “keep” us. The word bless (ברך) means “to kneel,” and keep (שמר) means “to guard.” The idea is that the king serves His people, and our King, the Lord in heaven is the one who humbles himself and come to his people. The Lord desires to draw near to us, and similarly, He desires for us to draw near to Him. Blessed are You, LORD our God, King of the universe, Who makes us holy with the holiness of Aaron, and has commanded us to bless His people Israel with love. The phrase “with love” is intended to represent the love of the LORD for His people. The point is that as the Lord God blesses us by His mercy and kindness, so too the kohen must seek to display God’s love in this manner. The preparatory blessing is intended to induce a state of kavanah in the heart of the one performing the commandment. According to the sages, the obligation to bless the people “with love” comes from the Torah. This is derived from the verse that immediately precedes the commandment to bless the people which says, כֹּה תְבָרֲכוּ אֶת-בְּנֵי יִשְֹרָאֵל אָמוֹר לָהֶם “Thus you shall bless the people of Israel: you shall say to them…” If we consider the Hebrew text, and specifically the Hebrew words, the full verses the defective spellings of the words in the Torah, according to this verse, the word “say” (אָמוֹר) is spelled in the full spelling. This has been interpreted to mean the blessing is not to be conducted half heartedly or in an impatient manner. One must be whole-hearted, and sincere in one’s desire to send forth the blessing of God to the people. This indicates the importance of the one who is blessing having a deep desire to see others being blessed. In a similar manner, the one who is receiving the blessing is also to be sincere and whole-hearted in his desire to receive the blessing. Thus, when the priest lifts his hands during the recitation, “May the LORD bless you and keep you…,” the Sages regard this as vital for every blessing that is proclaimed by the kohen. Note that Yeshua says “Teshuvah” for the forgiveness of sins would be proclaimed in His name to all the nations. Repentance is a leading factor in the forgiveness of sins. Yeshua said to his followers, “Peace I leave with you; my peace I give to you” (John 14:27 and 20:19). He is the Prince of Peace, as he is prophetically spoken of in Isaiah 9:6 For a child will be born to us, a son will be given to us; And the government will rest on His shoulders; And His name will be called Wonderful Counselor, Mighty God, Eternal Father, Prince of Peace. 9:7 There will be no end to the increase of His government or of peace, On the throne of David and over his kingdom, To establish it and to uphold it with justice and righteousness From then on and forevermore. The zeal of the Lord of hosts will accomplish this. (NASB) In the manner in which we read the Aaronic blessing is to be given, the Gospel account of Yeshua, just before he ascended to heaven says, 24:50 And He led them out as far as Bethany, and He lifted up His hands and blessed them. (NASB) This blessing he gave over his disciples was Torah based and very familiar, and in doing so, Yeshua was establishing the Torah as a way of life for his disciples. This is what led them to return to the Temple, to worship God and continually praise Him in the Temple in Jerusalem. David opens the Psalm saying, ב אֱלֹהִים יְחָנֵּנוּ וִיבָרְכֵנוּ יָאֵר פָּנָיו אִתָּנוּ סֶלָה: 67:1 God be gracious to us and bless us, And cause His face to shine upon us Selah. (NASB) According to Tehillim / Psalms 67:2-4, David desires for the glory of the Lord to be known throughout the earth, ג לָדַעַת בָּאָרֶץ דַּרְכֶּךָ בְּכָל-גּוֹיִם יְשׁוּעָתֶךָ: ד יוֹדוּךָ עַמִּים | אֱלֹהִים יוֹדוּךָ עַמִּים כֻּלָּם: 67:2 That Your way may be known on the earth, Your salvation among all nations. 67:3 Let the peoples praise You, O God; Let all the peoples praise You. (NASB) The Aramaic Targum states, 67:3 To make known your way in the land, your redemption among all the Gentiles. 67:4 The Gentiles will give thanks in your presence, O God, all the Gentiles will give thanks. (EMC) What is the significance of the Gentiles giving praise and thanks in the presence of God? There are a couple of places in the Neviim section of the Tanach that describe the last days and the holy mountain of the Lord (see Isaiah 2, Micah 4). Isaiah prophesied that the mountain of the house of the Lord will be established as the head of mountains (יִהְיֶה הַר בֵּית-יְהֹוָה בְּרֹאשׁ הֶהָרִים). When we think about the mountain of the Lord, mountains have been used as a means for drawing nearer to the Lord. The illustration of the mountain draws us back to a Torah context, in the last days, the mountain of God will be raised up higher than the other mountains, and the nations will seek the Lord at this mountain, the eyes of the people will be upon this mountain and have a desire to draw near to God. Isaiah says, 2:3 And many peoples will come and say, ‘Come, let us go up to the mountain of the Lord, To the house of the God of Jacob; That He may teach us concerning His ways And that we may walk in His paths.’ For the law will go forth from Zion And the word of the Lord from Jerusalem. (NASB) In this prophecy of the last days, the people are seeking the Lord to walk in His ways, and in His paths. This is similar to Shemot / Exodus 24:17-18 which states, 24:17 And to the eyes of the sons of Israel the appearance of the glory of the Lord was like a consuming fire on the mountain top. 24:18 Moses entered the midst of the cloud as he went up to the mountain; and Moses was on the mountain forty days and forty nights. (NASB) We are told in 1 Kings 3:1 Solomon made an alliance with Pharaoh king of Egypt and married his daughter. He brought her to the City of David until he finished building his palace and the temple of the Lord, and the wall around Jerusalem. 3:2 The people, however, were still sacrificing at the high places, because a temple had not yet been built for the Name of the Lord. 3:3 Solomon showed his love for the Lord by walking according to the instructions given him by his father David, except that he offered sacrifices and burned incense on the high places. 3:4 The king went to Gibeon to offer sacrifices, for that was the most important high place, and Solomon offered a thousand burnt offerings on that altar. 3:5 At Gibeon the Lord appeared to Solomon during the night in a dream, and God said, “Ask for whatever you want me to give you.” (NIV) Here we find the people in the time of King Solomon were sacrificing at the high places (in the mountains), since the Temple of the Lord had not been built. It is interesting that nothing is stated concerning the Ark of God being in the city of David as opposed to the Tabernacle being in Gibeon. We are told that Gibeon was the most important high place. Why was Gibeon the most important high place? Gibeon was located in the territory of Benjamin (Joshua 18:25), and it was one of the cities for the Levites (Joshua 21:17). The city is also the place where God made the sun stand still during Israel’s war with the Amorites. (Joshua 10:12) In 1 Chronicles 9:35-39, Jeiel is mentioned as the “father of Gibeon” and is an ancestor of King Saul. The fight between the soldiers of Joab and those of Abner took place beside the Pool of Gibeon (2 Samuel 2:12). It was also in this area that David conquered the Philistines (see 2 Samuel 5:25 and 1 Chronicles 14:16). After David became king of Israel, a three year drought made him ask the Lord for the reason of the drought. The Lord indicated that He was angry at Saul for massacring the Gibeonites with whom Israel had made a covenant in the Lord’s name. David then spoke to the Gibeonites and asked them how he shall repay them. The Gibeonites asked for seven of Saul’s male descendants to be given to them to kill. David handed over Armoni and Mephibosheth, two of the sons of Saul and the five sons of Merab (Saul’s daughter) to the Gibeonites, and they were put to death (they were hanged). David saved Jonathan’s son Mephibosheth from this peril because of his covenant with Jonathan (2 Samuel 21:1-9). The idea of people making sacrifices at the high places is disconcerting by reason of the negative association we are given of the high places to places of pagan worship in the MT. The description that is given here indicates that the high places were not necessarily connected to pagan worship, but reflected the noncentralized worship that was taking place in Israel, with the Ark of God in the city of David, the Tabernacle in Gibeon, and the statement that Gibeon was the most important high place in Israel at that time. We are told in 1 Kings 3, that this high place was the most important high place, suggesting that this was a legitimate place of worship. In addition to this, we are told that the Ohed Moel (Tent of Meeting) made by Moshe and the bronze altar for burnt offerings, crafted by Bazelel (Shemot / Exodus 38:1-2, 2 Chronicles 1:5) were located at Gibeon (1 Chronicles 21:29). It might be with the death of Eli and his sons, and the final removal of Eli’s descendant, Abiathar, the fourth in descent from Eli (1 Samuel 23:6) and the last of Eli’s House. Abiathar was the only one of the priests to escape from Saul’s massacre, he fled to David at Keilah, taking with him the ephod (1 Samuel 22:20 and 23:6, 9). Abiathar was of great service to David, especially at the time of the rebellion of Absalom (2 Samuel 15:24-35 and 20:25). In 1 Kings 4:4, Zadok and Abiathar are found acting together as priests under Solomon. In 1 Kings 1:7-25, however, Abiathar appears as a supporter of Adonijah, and in 1 Kings 2:22-26 it is said that he was deposed by Solomon and banished to Anathoth. It may be that the Tabernacle was moved from Shilo to this location in Gibeon following the death of the priests that occurred at Shilo by the command of Saul at the hand of Doeg. The mention of the Tent of Meeting at Gibeon underscores the continuity of the Tabernacle and Israel’s sacrificial system that was set up by Moshe, Israel was serving the Lord God in the manner in which He designed. It is interesting to note the Ark of God being located in the city of David, while the Tabernacle and altar stood at Gibeon. However, these details of Solomon going to Gibeon to offer sacrifices, makes it clear that the high place at Gibeon was a legitimate and sacred place prior to the construction of the Temple in Jerusalem. In the Scriptures, the “high places” were given a negative connotation, but only following the completion of the Temple in Jerusalem. The construction of the Temple in Jerusalem seems to have inaugurated a time of centralized worship, which was anticipated according to the Torah in Devarim / Deuteronomy 12:13-14, however before the Temple there was a sort of decentralized worship occuring. Following the construction of the Temple, the high places were then associated with the worship of foreign deities, idolatry, and syncretism (the combining of the sacred and the profane). 1 Kings 3 mentions that Solomon offered 1000 sacrifices upon the altar indicating his reverence of the Lord God at the start of his rule as king of Israel. In addition, Solomon also offered a large number of sacrifices in the dedication of the Temple. In His Psalm, David sought for the glory of the Lord to be known throughout the earth saying, ג לָדַעַת בָּאָרֶץ דַּרְכֶּךָ בְּכָל-גּוֹיִם יְשׁוּעָתֶךָ: ד יוֹדוּךָ עַמִּים | אֱלֹהִים יוֹדוּךָ עַמִּים כֻּלָּם: 67:2 That Your way may be known on the earth, Your salvation among all nations. 67:3 Let the peoples praise You, O God; Let all the peoples praise You. (NASB) The Aramaic Targum states, 67:3 To make known your way in the land, your redemption among all the Gentiles. 67:4 The Gentiles will give thanks in your presence, O God, all the Gentiles will give thanks. (EMC) Generally, the nations posed a threat to David and to the nation of Israel. When there is peace on every side, we know that the Lord’s is at work in the hearts of men. David says “that Your way may be made known,” and the rabbis translate “to make known Your way in the land.” The way of the Lord is peace, righteousness, holiness, and justice, note these are the mitzvot found in the Torah. The blessing of His deliverance, will be proclaimed among the nations because of God’s mighty hand to deliver Israel. Do not engage in incestuous, adulterous or homosexual relationships. Do not eat of a live animal. Establish courts/legal system to ensure law and justice. The rabbinic understanding of the ger toshav, and the חסיד אומות העולם “Pious People of the World” most likely is what Paul was thinking upon when he wrote what he did to the Romans, the Galatians, and Colossians. Take for example what he wrote to the Colossians. Paul speaks of worshiping angels (idolatry), to fleshly indulgence (immorality), to not lie, or steal, etc, Paul is drawing us back to the Torah command. While reading Colossians 2:20-22, this must be kept in mind that Paul is not speaking against the Torah command, rather, he is trying to say what good is the command if one lives with fleshly indulgence? We cannot live with partial obedience (3:6), all of one’s life must be consistent in the sense that one does not have “hidden sin” in the eyes of God for He sees all! David concludes His Psalm saying, ו יוֹדוּךָ עַמִּים | אֱלֹהִים יוֹדוּךָ עַמִּים כֻּלָּם: ז אֶרֶץ נָתְנָה יְבוּלָהּ יְבָרְכֵנוּ אֱלֹהִים אֱלֹהֵינוּ: ח יְבָרְכֵנוּ אֱלֹהִים וְיִירְאוּ אֹתוֹ כָּל-אַפְסֵי-אָרֶץ: 67:5 Let the peoples praise You, O God; Let all the peoples praise You. 67:6 The earth has yielded its produce; God, our God, blesses us. 67:7 God blesses us, That all the ends of the earth may fear Him. (NASB) David is very likely referring to the righteous who live among the nations (both Jew and Gentile). With regard to the righteous who live among the nations, is there salvation outside of being joined with Israel? What does it mean to be joined with Israel? According to Paul (Galatians 3:26-29) in the Messiah we are joined with Israel (Romans 11) and we are obligated to obey all of God’s Torah (Colossians 2:20-3:12). Paul, like some of the rabbis in the Talmud, believes in One Torah for all people. Therefore, even in the Messiah Yeshua, it is important to take hold of God’s Salvation by faith, and live out our salvation by being obedient to His command (see John 10 and 14). Faith is the composition of two things, (i) a belief in the Lord, in the Messiah, and in the Scriptures, and (ii) practice, we live what we believe. Faith is not authentic if these two things are not coupled together. This is what Yeshua meant when he said in Luke 20:35 But those who are considered worthy of taking part in the age to come and in the resurrection from the dead will neither marry nor be given in marriage. (NASB) Yeshua did not say “just believe in me and you will be saved.” Yeshua understood and taught that faith includes both belief and practice. True faith is that which is lived out, we are not to live two separate lives. If one has two separate lives, then be warned based upon what Yeshua said in Matthew 7, there are those who come before Me on that great day and I will tell them, depart from Me I never knew you, worker of lawlessness (anomia). 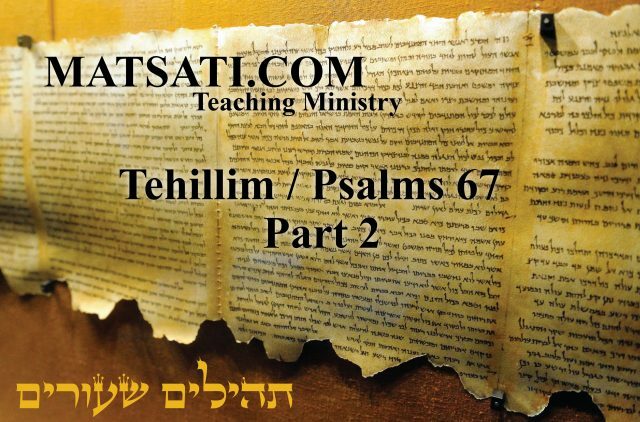 The Rabbinic Commentary (Midrash) on Tehillim / Psalms 67 has 2 part. Reading through the Midrash we will be looking at Part 1 and 2. Let’s begin by outlining Midrash Tehillim Chapter 67, Parts 1 and 2. The משל (mashal) “the parable,” goes on to explain the פתיחתא (Petihta), the rabbis comment upon David’s words speaking about the Lord God who is merciful and compassionate, who does not allow His people to be totally consumed and destroyed. The נמשל (Nimshal) “expansion on the parable” expands upon the משל (mashal), the rabbis expand upon the mashal stating how Greece will fall at the hand of Levi, which is the work of the Lord God in heaven. The משל (mashal) “the parable,” goes on to explain the פתיחתא (Petihta), the rabbis comment upon David’s words saying that the Lord is known by His strength amongst His people. The נמשל (Nimshal) “expansion on the parable” expands upon the משל (mashal), the rabbis expand upon the mashal by the nations seeing the strength of the Lord to deliver Israel, they will confess God’s justice. Midrash Tehillim 67, Part 1 opens with the Dibur Hamathil (דיבור המתחיל) saying “For the leader; with string music. A Psalm, a song. God be merciful unto us, and bless us (Tehillim / Psalms 67:1-2).” The homiletic introduction to the midrash states, “These words are to be considered in the light of what Scripture says elsewhere, Surely the Lord’s mercies are not consumed, surely His compassions fail not (Lamentations 3:22).” David’s words calling out to the Lord God in heaven to be merciful, according to the midrash, is a reference to what Scripture states, the Lord is merciful, and His compassions do not fail. In many places throughout the Tanach, we find references to the mercy, the lovingkindness, and the grace (חסד) of God towards His people. Why is it today in Christianity we continue to hear music artists such as Lauren Daigle in her song titled “How Can It Be” singing and saying “there is only grace now?” Where does this concept of “there is only grace now” come from? This comes from the general idea that God is different in the OT as opposed to what we read in the NT. This concept of the Lord God that is supposed to be derived from the Tanach, is due to the general illiteracy of Christians on what is written in the Bible, specifically in the Torah, the Prophets, and the Writings. At the center of this belief of the Lord God changing is a fundamental misunderstanding of what both the Tanach and the Apostolic Writings reveal about the nature of God. The general statements that are made is “The God of the Old Testament is a God of wrath while the God of the New Testament is a God of love.” The misconception is not necessarily extinguished when one gets on a yearly bible reading schedule because this concept of God has been so established in the minds and hearts of most believers by way of faulty doctrine. A careful comparison of both the Tanach and the Apostolic Writings however reveals that God is not different from one testament to the other, God’s wrath and His love are revealed in both testaments in a very consistent fashion. For example, the Lord God is declared to be compassionate and gracious, slow to anger, and abounding in love and faithfulness throughout the Tanach. These are only a few verses which demonstrate the mercy and grace of God in the Tanach. It is taught that in the New Testament, God’s lovingkindness (חסד), His mercy and grace, are manifest in a greater way through the fact that “God so loved the world that he gave his one and only Son, that whoever believes in him shall not perish but have eternal life” (John 3:16). However, throughout the Torah, the Prophets, and the Writings, we also see the Lord God dealing with Israel in the same way a loving father deals with his children. When they willfully sinned against Him turning from His commands and worshiping idols, the Lord would punish them. Yet, each time He would also deliver them once they had repented of their idolatry and sin. This is the same way in which the Lord God deals with His children today according to the New Testament. For example, Hebrews 12:6 tells us that “the Lord disciplines those he loves, and he punishes everyone he accepts as a son.” We find passages from the Apostolic Writings on the Lord’s punishment being the same as what is described in the Tanach. These Scriptures are consistent with David’s words in Tehillim / Psalms 50 of standing in the presence of the Lord God which states, ב מִצִּיּוֹן מִכְלַל-יֹפִי אֱלֹהִים הוֹפִיעַ: ג יָבֹא אֱלֹהֵינוּ וְאַל-יֶחֱרַשׁ אֵשׁ-לְפָנָיו תֹּאכֵל וּסְבִיבָיו נִשְֹעֲרָה מְאֹד: ד יִקְרָא אֶל-הַשָּׁמַיִם מֵעָל וְאֶל-הָאָרֶץ לָדִין עַמּוֹ: 50:2 Out of Zion, the perfection of beauty, God has shone forth. 50:3 May our God come and not keep silence; Fire devours before Him, And it is very tempestuous around Him. 50:4 He summons the heavens above, And the earth, to judge His people (NASB) In 2 Thessalonians, Paul speaks of Yeshua returning with His angels as a consuming fire, and praying for believers that the Lord God would count us worthy of our calling and of the work of faith. The author of Hebrews speaks of willful sin, and those who willfully sin there is no hope for which he says, 10:30 For we know Him who said, ‘Vengeance is Mine, I will repay.’ And again, ‘The Lord will judge His people.’ 10:31 It is a terrifying thing to fall into the hands of the living God. (NASB) These Scriptures are speaking of the Lord pouring out his judgment upon sin. In a similar manner, throughout the Tanach we see God’s judgment and wrath poured out on sin. In the Apostolic Writings we see the wrath of God also “being revealed from heaven against all the godlessness and wickedness of men who suppress the truth by their wickedness” (Romans 1:18). Based upon this analysis of the Scriptures, the Lord God is clearly no different in the Old Testament than He is in the New Testament. God by His very nature is immutable (unchanging). Throughout the Scriptures we see various aspects of God’s nature, and in both the Tanach and the Apostolic Writings we see His love, mercy, and grace revealed in certain passages of Scripture more than other aspects, and yet the Lord God Himself does not change. This is why the Rabbis in the midrash state, Surely the Lord’s mercies are not consumed, surely His compassions fail not (Lamentations 3:22). As we read and study the Scriptures, it becomes clear that God is the same throughout the entire Bible. In the Scriptures we see how a loving, merciful, and just God deals with disobedient and sinful men in all kinds of situations. Throughout the Bible we also see the Lord God lovingly and mercifully calling His people to draw near, not because they deserve it, but because He is a gracious and merciful God, slow to anger and abundant in lovingkindness and truth. We also see a holy and righteous Lord who is the Judge of all those who disobey His Word and refuse to worship Him and obey his commands, turning instead to worship gods of their own creation such is as what we read in Romans chapter 1. The proof text the rabbis use comes from Tehillim / Psalms 83:5, the nations say to themselves, “Come and let us cut them off from being a nation,” however, the Lord’s compassions do not fail and He delivers Israel. (Bamidbar / Numbers 22:2-25:9) This reminds us of Bilam’s attempts at cursing the nation of Israel. Balak king of Moab saw what the children of Israel had done to the Amorites and both he and the people of Moab were afraid and anxious about Israel’s presence. As a result, Balak asks for help from Bilam. Now Bilam was well known according to Balak indicated by the statement he makes concerning Bilam saying, כִּי יָדַעְתִּי אֵת אֲשֶׁר-תְּבָרֵךְ מְבֹרָךְ וַאֲשֶׁר תָּאֹר יוּאָר “For I know that he whom you bless is blessed, and he whom you curse is cursed.” (22:6). According to the Torah, Bilam was a man who had the ear of the Lord God in Heaven. He had a reputation that he could hear from God. As the story goes, at the persistence of Balak, Bilam travels with the men from Balak and God’s anger burned against Bilam. The Angel of the Lord stood in the way of Bilam’s donkey to slay him. Bilam is very persistent; three times he turns to continue on his way being unaware that his life was in eminent danger. These Scriptures are important for giving us wisdom, since being disobedient to the command is paralleled to being in eminent danger because we do not know at what point God’s mercy might run out for the one who ignores repentance in the midst of his or her sins. The Lord tarries for the purpose of our repentance and turning from the ways of sin. If we continue to sin without regard for repentance, the Lord’s mercy will cease. In Bamidbar / Numbers 22:28, the Scriptures say that God opened the donkey’s mouth, כח וַיִּפְתַּח יְהוָֹה אֶת-פִּי הָאָתוֹן וַתֹּאמֶר לְבִלְעָם מֶה-עָשִֹיתִי לְךָ כִּי הִכִּיתָנִי זֶה שָׁלשׁ רְגָלִים: God opened the mouth of the donkey, and it said to Bilam, “What have I done to you, that you hit me these three times. While reading this text, it is noteworthy the word the donkey uses to describe Bilam striking him three times. In the Torah, the word that is generally used for “times” in the case of repetition is “Pe’amim” (פעמים), however, when the donkey spoke he used the word “regalim” (רְגָלִים) which generally denotes the “Festivals.” What is the Lord trying to tell us by inspiring this donkey to speak to Bilam saying “Shelosh Regalim” (שָׁלשׁ רְגָלִים) regarding the three times Bilam struck him? 22:21 So Balaam arose in the morning, and saddled his donkey and went with the leaders of Moab. 22:22 But God was angry because he was going, and the angel of the Lord took his stand in the way as an adversary against him. Now he was riding on his donkey and his two servants were with him. In the middle of the narrative the rabbis add a comment on the ten things God created after the word had been founded at the coming of the Shabbat. The ten things are (i) manna, (ii) the well (water), (iii) the rod of Moshe, (iv) the diamond, (v) the rainbow, (vi) the cloud of glory, (vii) the mouth of the earth, (viii) the writing of the tables of the covenant, (ix) the demons, and (x) the talking donkey. Notice that the rabbis list food and water, the rod which is a symbol of power, wealth / money (diamond) the covenant and the glory of God, destruction (“the mouth of the earth” e.g. Parashat Korach), evil spirits and then the donkey that spoke. Why do you think these things are added into the Targum translation? Bilam’s reason for beating the donkey was because he would not obey him. The beast responds pointing out the faulty logic Bilam has to disobey the Lord and Bilam having no sword to destroy the donkey. Considering the list of ten things, what the Lord has created man is not able to change. The way the Lord has saved Israel and worked in her deliverance, the covenant He has made with her, all of these things can be drawn out of the context of the beast speaking “Shelosh Regalim” (שָׁלשׁ רְגָלִים) and man not having the authority to change what God has established. The parallel is that though Bilam desires to curse and destroy Israel, he is unable to do so because the world itself was created on behalf of the righteous, the children of Abraham, Isaac, and Jacob. As we have studied previously, in your walk before the Lord God, are you counted as one of the righteous, in the Messiah Yeshua, and a child of Abraham? Those who have an evil eye, an arrogant spirit, and an insatiable soul are pupils of the wicked Bilam. According to the Mishnah, the evil eye is synonymous to jealousy and the arrogant spirit to the desire for honor, and the insatiable soul to lust. Bilam had an evil eye to do harm to Israel and in the process to be honored by men and get wealthy at the same time for cursing Israel. Consider also what the donkey said to Bilam asking him why he struck him “Shelosh Regalim” (שָׁלשׁ רְגָלִים)? According to the Torah, the Shelosh Regalim are Pesach, Shavot, and Sukkot. Pesach – According to the Torah, Passover was the first time when Israel was drawn away from the idols of Egypt and brought under God’s protection. The matzah (unleavened bread) is a symbol of the poor and humble of spirit. This typifies the rejection of the path of Bilam who was arrogant, prideful, and an idolater. Shavuot – Is the time the Torah was given to Israel at the mountain of Sinai. This represents the nation turning from sin and from the ways of the world and receiving God’s love, mercy, and covenant. In preparation for the receiving of the Torah, one was told to separate themselves (consecrate) for three days. This typifies the rejection of the path of Bilam and his desires of lust, wealth, and fame. Sukkot – This is the festival in which we set in booths, setting aside our differences in wealth and riches and come together to celebrate the deliverance of the Lord. This typifies the rejection of the path of Bilam which corresponds to jealousy and the evil eye. The Shelosh Regalim describe God’s plan for our lives, He delivered us from a life of sin and idolatry, He gave his Torah to guide us in how to turn from sin and towards His ways, and then He (the Lord) comes to dwell in our midst, to dwell among us, and to help us to live for Him. In the narrative from Bamidbar / Numbers, the beast spoke and the Lord opened Bilam’s eyes and he was able to see the angel of the Lord standing against him with his sword drawn. The Lord stands against evil men who seek to do harm to others, and who follow the path of Bilam. Are you following the path of Bilam today? Does your walk and faith demonstrate that you take your relationship with God seriously? What about prayer; do we understand prayer according to the Bible or do we understand prayer like Bilam understood prayer? In Bamidbar / Numbers 22:34-35, the Hebrew text is written in the past tense, Bilam says “Khatati” (חָטָאתִי) “I have sinned” and “ki lo yadati” (כִּי לֹא יָדַעְתִּי) “because I did not know.” The verb tense indicates that Bilam recognized his sin and says, וְעַתָּה אִם -רַע בְּעֵינֶיךָ אָשׁוּבָה לִּי “now if it is evil in your sight then I will ashuvah.” The word “ashuvah” is from the same root for “Teshuvah” meaning to turn, repent, go in a different direction. Bilam recognized his sin and is repenting, “turning back,” “turning away” from the sin that he was committing. An interesting point is that Bilam was not given the Torah, so his repenting and turning was not in the way God wanted. This might be one explanation for the Lord seeking to kill Bilam after having given him permission to go with Balak since he was still walking in his own ways. The most interesting aspect of the text from the Torah is that even though Bilam was seeking God’s will and praying, He failed to understand the purpose of drawing close to the Lord God Almighty in mercy and truth. Based on the text, Bilam believed that through prayer and by his actions, he would be able to force God to do his will. Bilam failed to understand that the function of prayer is not to influence God but rather to change the nature of the one who prays. According to the Scriptures we know that prayer is not intended to manipulate God into giving us our own way, but to be in His will. Yeshua spoke of this in Matthew 6:5-14, saying that when we pray, we are not to be like the hypocrites, who love to stand and be known of men. He taught his disciples to pray saying, “Our Father who art in Heaven, holy is Your Name, Your will be done on earth as it is in heaven …” (Matthew 6:9-13). In addition to this, if we walk in the path of Bilam, arrogant, prideful, having a lust for wealth and fame, being jealous and having the evil eye, regarding sin in our hearts, will the Lord hear our prayers? Bilam did not know the truth and he followed the path of destruction all the way up until the end. Based upon the narrative in Parashat Balak, a donkey can see God’s will, but a greedy person will always look for a way around it. The Apostle Paul’s exhortation to the believers in Thessalonica on the will of God is given in 1 Thessalonians 4:1-8. Paul says the will of God is to sanctify ourselves by abstaining from sexual immorality and not to live in lustful passion like the Gentiles do who do not know God. He also says we should not transgress and defraud our brothers because the Lord sees and avenges in all these things. Lustful passion can come in many forms, as in the case of Bilam, arrogance, pride, desiring wealth and fame, jealousy and having the evil eye towards a brother. According to the Scriptures, God’s truth is believing in Yeshua the Messiah which is followed by an obedient lifestyle (abiding in the Messiah). The way, the truth, and the life is found in Him, and the fruit of this life in Him is found in the Holy Spirit that is given to overcome our lustful passions and turn from the path of Bilam to God’s ways of righteousness, justice, and truth! The rabbis said in the midrash that His compassions do not fail. They also say, Great is Your faithfulness, refers to Your faithfulness in what You did promise to our fathers, After we went down before Babylon, You foresaw the kingdom of Greece, he began to pray. For what did he pray? That Greece should fall at the hand of the tribe of Levi. And Moshe said, Bless, Lord, his might (Devarim / Deuteronomy 33:11). Does it seem strange that the midrash speaks of Greece falling at the hand of the tribe of Levi? The Levites were not called to go out in war before Israel. Their inheritance was to minister before the Lord continually, and yes, to also be present during war time, but continuing in the presence of the Lord in their duties. Why do the rabbis say it is at the hand of the tribe of Levi that Greece will fall? Remember the Torah and how God delivered Israel from Egypt at the hand of Moshe and Aaron. The Lord sent those leaders from the tribe of Levi to speak the word of the Lord to the foreign nation. The Lord God Almighty moved and destroyed an entire nation. The midrash is speaking of our having faith, belief, and trust in the Lord God in heaven to deliver and even to destroy a nation on our behalf. Note that destruction may also be thought in the sense of turning a man, men, and a nation away from sin and towards the Lord. This is the destruction of one’s former life, one’s former ways of sin. The Lord turning one from his former ways may also be paralleled to the destruction of an entire nation, and the raising up of a nation, men, or a man unto Himself. Midrash Tehillim 67, Part 1 concludes saying, “And so, too, bless the children of Israel, as it is said, God be merciful unto us, and bless us. If You do bless us, You will make Your strength and Your way known among the nations, as is said, That Your way may be known upon the earth, Your salvation among all nations (Tehillim / Psalms 67:3).” Ultimately, the midrash is directing our attention to the Lord, to His Mercy and Grace, and to His strengthening power to transform our lives for His glory, and so that His ways are made known upon the earth and God’s salvation being proclaimed among all the nations. אין הקב״ה מושיע לישראל במעשיהן, אלא להודיע גבורתו ולהודיע שמו הגדול, וכן אסף אמר נודע ביהודה אלהים בישראל גדול שמו (תהלים עו ב), ואומר אתה האל עושה פלא הודעת בעמים עוזך (שם תהלים עז טז), מה העוז שהודעת גבורתך בעולם, לגאלם בעוזך ובזרועך, ואומר ויושיעם למען שמו (שם תהלים קו ח), למה להודיע גבורתו, שהקב״ה מושיע את ישראל, יכול שיאמרו הגוים נושא להם פנים, אלא מודים לו, שנאמר יודוך עמים, אלהים יודוך עמים כולם (תהלים ס״ז פסוק ו), למה שהקב״ה מוציא צדקתם של ישראל לאורה, שנאמר והוציא כאור צדקך (שם תהלים לז ו), וכתיב וראו גוים צדקך וכל מלכים כבודך (ישעיה סב ב), וכתיב כן ה׳ אלהים יצמיח צדקה ותהלה נגד כל הגוים (שם ישעיהו סא יא). 2. The Holy One blessed be He, does not save Israel because of their good deeds, but only to make His strength known and to make His great name known. As Asaph said, Through Judah will God be known; His name will be great through Israel (Tehillim / Psalms 76:2). And as Asaph also said, You are the God that does wonders; You have made known Your strength among the peoples (Tehillim / Psalms 77:15). What is meant by the words Your strength? In that you redeem Israel by Your strength and by Your arm, You make Your might known in the world. Another Psalm says, Nevertheless He saved them for His name’s sake (Tehillim / Psalms 106:8). Why? To make His might known. It might be supposed that when the Holy One blessed be He, saves the children of Israel, the nations will say, God is partial to them. But in truth, the nations will acknowledge God’s justice, as is said, The nations will acknowledge You, all of them (Tehillim / Psalms 67:6). Why? Because the Holy One blessed be He, will bring forth the righteousness of the children of Israel to the light, as it is said, And He will bring forth your righteousness as the light (Tehillim / Psalms 37:6); and as it is written, And the nations will see your righteousness, and all kings your glory (Isaiah 62:2); and as it is also written, The Lord God will cause righteousness and praise to spring forth before all the nations (Tehillim / Psalms 61:11). Why does Asaph say, “Through Judah will God be known; His name will be great through Israel?” The reason Asaph makes this statement is by reason of the Davidic Covenant. The Davidic Covenant refers to God’s promises to David through Nathan the prophet which is found in 2 Samuel 7 and summarized in 1 Chronicles 17:11–14 and 2 Chronicles 6:16. In this covenant, the Lord God said that through the line of David, He would bring His Messiah. From the lineage of David and the tribe of Judah the Messiah would come and would establish a kingdom that would endure forever. This is why Asaph states, “through Judah will God be known.” The Davidic Covenant is considered unconditional because the Lord does not place conditions of obedience upon its fulfillment meaning that the surety of the promises rests solely on God’s faithfulness to David. The Davidic Covenant centers on several key promises that are made to David, the Lord affirms the promise of the land that He made to Abraham and at Sinai. This promise is seen in 2 Samuel 7:10, where the Lord says through the prophet, “I will provide a place for my people Israel and will plant them so that they can have a home of their own and no longer be disturbed. Wicked people will not oppress them anymore.” The Lord promises that David’s son will succeed him as king of Israel and that this son (Solomon) would build the temple, 2 Samuel 7:12-13 “ I will raise up your offspring to succeed you, your own flesh and blood, and I will establish his kingdom. He is the one who will build a house for my Name.” The promise continues and expands saying, “I will establish the throne of his kingdom forever” (7:13), and “Your house and your kingdom will endure forever before me; your throne will be established forever” (7:16). The promise that David’s son Solomon would be blessed and build the temple becomes the promise of an everlasting kingdom. According to the promise given to David, another “Son of David” would rule forever and build a lasting House. This is a reference to the Messiah, where Yeshua is called the Son of David in Matthew 21:9. The idea that David’s “house,” “kingdom,” and “throne” will be established forever is significant because it shows that the Messiah will come from the lineage of David and that He will establish a kingdom from which He will reign. The manner in which the promise is written seems to summarize the intent the Lord God has in the Messiah Yeshua. The covenant is summarized by the words “house,” promising a dynasty in the lineage of David; “kingdom,” referring to a people who are governed by a king; “throne,” emphasizing the authority of the king’s rule; and “forever,” emphasizing the eternal and unconditional nature of this promise to David and to Israel. In addition, others (the prophets and disciples) refer back to this covenant in the books of Jeremiah 23:5, 30:9, Isaiah 9:7, 11:1, Luke 1:32, 1:69, Acts 13:34, and Revelation 3:7. And as Asaph also said, You are the God that does wonders; You have made known Your strength among the peoples (Tehillim / Psalms 77:15). What is meant by the words Your strength? In that you redeem Israel by Your strength and by Your arm, You make Your might known in the world. Another Psalm says, Nevertheless He saved them for His name’s sake (Tehillim / Psalms 106:8). Why? To make His might known. It might be supposed that when the Holy One blessed be He, saves the children of Israel, the nations will say, God is partial to them. But in truth, the nations will acknowledge God’s justice, as is said, The nations will acknowledge You, all of them (Tehillim / Psalms 67:6). Why? The midrash states that the Lord redeemed Israel by His own strength for the purpose of making known His might to the world for His name’s sake. He saved Israel for His name’s sake. Does the Lord continue to function in this manner today? If we are to believe the Scriptures that the non-Jew is graft into Israel, then according to the Apostolic Writings, the Lord does function in the same manner and as the previous midrash states “If You do bless us, You will make Your strength and Your way known among the nations, as is said, That Your way may be known upon the earth, Your salvation among all nations (Tehillim / Psalms 67:3). The Lord is continuing to function in the same manner as He has in the past; He is delivering His people Israel for His name’s sake and for His glory. Take for example the following Scriptures from the Apostolic Writings. Yeshua states that for the sake of the Name (His name) we will endure trials and tribulations, and we will be hated to the point of persecution and death. In this way, the Lord is glorified and He makes known His name and His might in our faith. Midrash Tehillim 67, Part 2 concludes saying, “the Holy One blessed be He, will bring forth the righteousness of the children of Israel to the light, as it is said, And He will bring forth your righteousness as the light (Tehillim / Psalms 37:6); and as it is written, And the nations will see your righteousness, and all kings your glory (Isaiah 62:2); and as it is also written, The Lord God will cause righteousness and praise to spring forth before all the nations (Tehillim / Psalms 61:11).” Notice how the midrash speaks of righteousness, the children of Israel, the light, and the nations seeing. This again brings us back to the idea that Faith is the composition of two things, (i) belief – in the Lord, in the Messiah, and in the Scriptures, and (ii) practice – we live what we believe, our lives shine forth righteousness in the Messiah. Faith is not authentic if these two things are not coupled together. This is what Yeshua meant when he said in Luke 20:35, “those who are considered worthy of taking part in the age to come and in the resurrection from the dead” Yeshua did not say “just believe in me and you will be saved.” He understood and taught that faith includes both belief and practice. If we are practicing our faith, we will suffer for His name’s sake. Have you suffered for His name’s sake? Let’s Pray! Previous articleBits of Torah Truths, Parashat Bamidbar, Is there a New Priesthood?